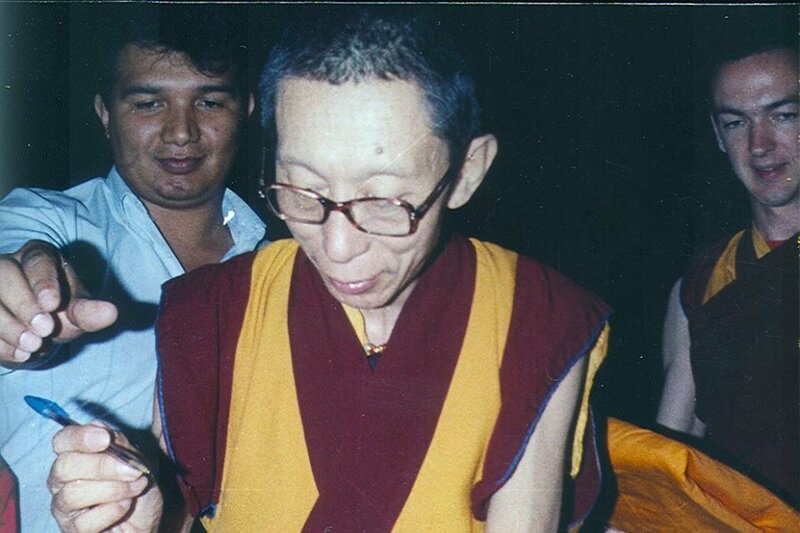 Venerable Geshe-la had been invited to Guadalajara where he gave teachings and empowerments. While there, he established Asanga Center, which was the first Kadampa center in Mexico. Interest in Kadam Dharma grew and by 1994 there was a thriving branch group in Mexico City, 280 miles away. The Teacher in Guadalajara would travel to Mexico City every week to give teachings. With Mexico City being the largest city in the world at that time, Venerable Geshe-la suggested the center relocate there from Guadalajara. In this way, in 1995, Dharmachakra Buddhist Centre was born, later to become KMC Mexico. The situation was now reversed and the center in Mexico City provided Teachers to travel to Guadalajara to teach. Later in 2013, KMC Guadalajara was opened at a ceremony presided over by Gen-la Kunsang. Both KMCs are now thriving with plans for further expansion in the near future. When KMC Mexico was first established it occupied a small house with a meditation room for 40 people and rooms for 3 residents. Then in 2006 the center moved to larger premises with a meditation room for 100 people and accommodation for 9 residents, which it still occupies. With the classes becoming increasingly popular, the center soon outgrew its building and a commercial space was acquired and converted to a City Temple with a meditation room for 180 people. It is located in a busy downtown area, within walking distance from the residential center. Due to this expansion the center is now able to hold large afternoon courses each month and reach a different sector of the public. Today, both the original Residential Center and the City Temple are are open 7 days a week with activities morning, midday and evening. The residential Center and the City Center are now proving too small for the activities and interest of the people. There are plans to move to an all inclusive location, with a larger meditation room and residential area and a built-in modern city space in the heart of the commercial, business and cultural district, called Roma. For more information on KMC Mexico and its program visit the website. In 2012 Gen Kelsang Sangden was appointed as Resident Teacher of KMC Mexico. She is also the National Spiritual Director for Mexico, Chile, Colombia, Peru, and Nicaragua. 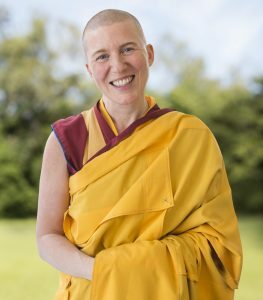 Gen Sangden has been practicing Kadampa Buddhism for over 20 years and is appreciated by many for her good example, practical teachings and clear and loving advice. The center in Guadalajara had a most auspicious beginning. While Venerable Geshe-la was living in San Antonio just south of the city he was requested to give teachings in Guadalajara itself. Within two days everything was arranged for him to teach two classes at a bookstore in the city. Even at such short notice eighty people came. Venerable Geshe-la taught in English while his assistant translated into Spanish. The bookstore was so full there were people standing out in the street. People were very enthusiastic and at the end everyone applauded! After the second talk, almost everyone present took refuge with Venerable Geshe-la! While in Guadalajara, Venerable Geshe-la designed a shrine for the new center. The drawings for this shrine were later used as the basis for the shrine at the Temple in New York. And so it was that the seeds for Kadam Dharma in Guadalajara in particular and Mexico in general were sown by the holy Spiritual Guide. Today KMC Guadalajara occupies a City Temple transformed from a commercial space. But it has now outgrown its space and has acquired larger premises with a proposed meditation room for 300 people. What started as the seeds of an extraordinary vision sown by Venerable Geshe-la all those years ago continues to grow into a wishfulfilling tree fulfilling the spiritual wishes of the people of Guadalajara and far beyond. How fortunate we are! To find out more about KMC Guadalajara and its program visit there website. 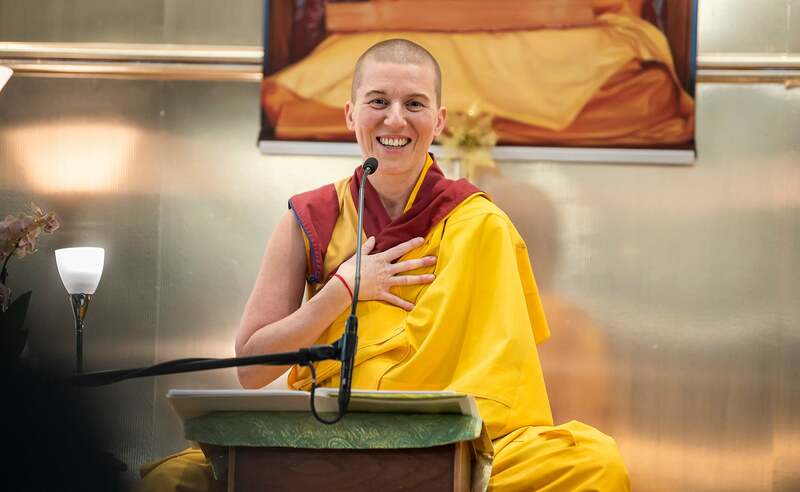 The Resident Teacher of Kadampa Meditation Center Guadalajara is Gen Kelsang Lobon. 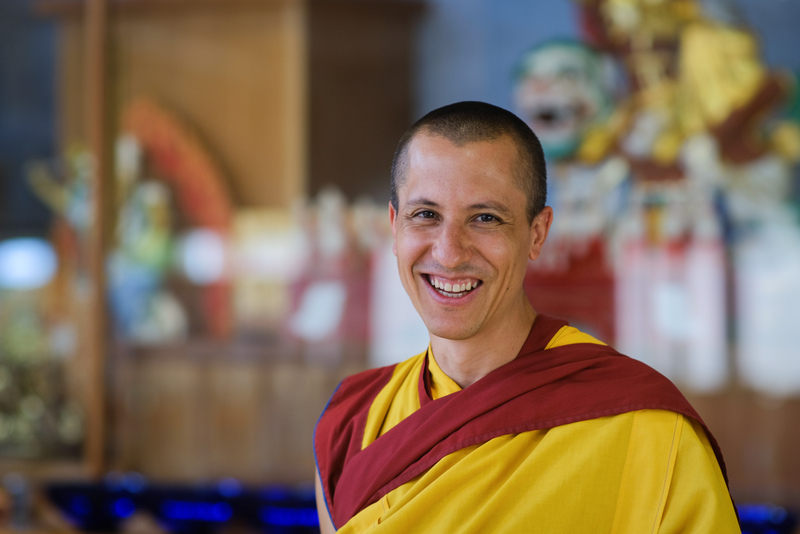 ​He is a Mexican Kadampa Buddhist monk who shares Buddha´s wisdom in a clear, joyful and simple way. Through his teachings he shows how easy it is to put Buddha´s advice into practice in daily life. KMC Mexico is the home of Editorual Tharpa, part of Tharpa International (tharpa.com). It is responsible for printing all of Venerable Geshe-la's books in Spanish and distributing them throughout Mexico and surrounding countries. Each year the Tharpa team from Mexico City travel to the international book fair in Guadalajara. Every year, KMC Mexico hosts the National Kadampa Festival and the National Dharma Celebration. In 2018 at the National Festival Gen-la Dekyong the General Spiritual Director of NKT-IKBU gave the empowerment and commentary to Heruka and Vajrayogini, and in 2019 Gen-la Kunsang will give the empowerment of Manjushri.